Like Reishi, Chaga's wide-ranging benefits derive from its combination of polysaccharide and triterpene (betulinic acid derivatives) components. 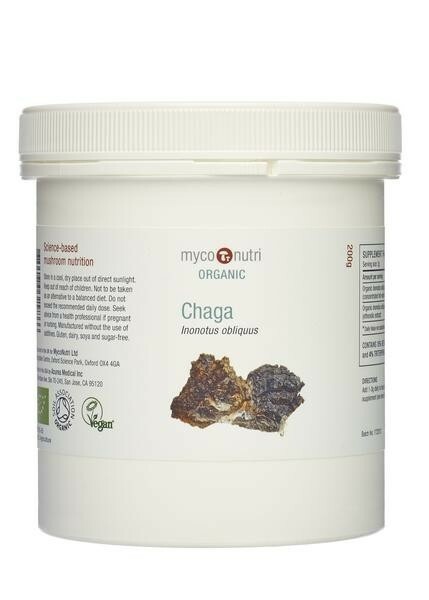 In order to deliver the full-spectrum of this mushrooms' activity the Chaga used in MycoNutri Organic Chaga is wild-harvested in pollution-free areas of Siberia then extracted twice with hot-water and once with ethanol before the combined extracts are concentrated and spray-dried without the addition of maltodextrin or other carriers to achieve a finished product with a minimum of 15% beta-glucans and 4% triterpenes. 200g Inonotus obliquus pure hot-water and ethanolic dual extract.